We now know who is going to be hosting the Oscars next year, and it's not exactly a huge surprise. 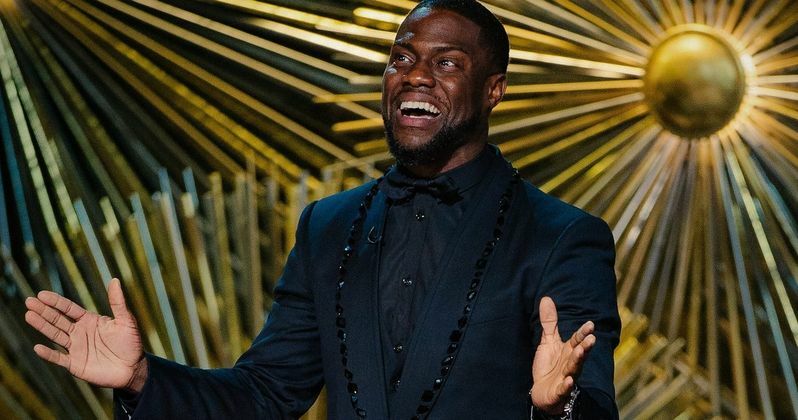 Comedian Kevin Hart has been officially chosen for the role, and it will be his first time serving as the show's emcee. This follows earlier reports that the actor had been in talks with the Academy of Motion Picture Arts and Sciences about hosting the ceremony. In response, Hart has publicly said he's happy to rise to the occasion to "make this year's Oscars a special one." The show will be produced for the first time by Donna Gigliotti and Glenn Weiss, with the latter also serving as the director. For the past two years, the Oscars ceremony had been hosted by late-night comedian Jimmy Kimmel, with Michael De Luca and Jennifer Todd producing. Ratings have also been consistently declining for the broadcast, resulting in last year's record-low numbers of 26.5 million viewers. That certainly can't be attributed solely to Kimmel, with less and less people watching live TV broadcasts as technology advances. Still, with an all new creative team leading the program, the goal is still to try to steer that ship back in the other direction. It will be interesting to see if Hart taking over will help improve the ratings, or if overall interest in the Oscars is declining regardless of who may host the show. Trying a new host isn't the only way the Academy is looking to make the kudocast more entertaining. Regarding complaints from viewers that the show always ran too long, it's been promised to be concluded within three hours. To help make this possible, many of the Oscar award winners won't be announced live on the show. Six to eight of the 24 overall categories will be announced to the live audience during commercial breaks to keep the flow going. Later in the show, excerpts from the award winners' acceptance speeches will be played, still letting TV viewers know who won each award. This news follows the nixing of a planned "popular" Oscar meant to recognize box office blockbusters, which was shelved due to the negative reaction it brought. Hart seems to be an excellent choice to take on The Academy Awards. He has hosting experience dating back to 2011 when he hosted the BET Awards, followed by the MTV Video Music Awards a year later. Hart would later host the Comedy Central Roast of Justin Bieber before co-hosting the MTV Movie Awards with Dwayne Johnson. Additionally, Hart has hosted three episodes of Saturday Night Live. During this time, the comedian has often spoken of his desire to one day host the Oscars, so this is basically a dream come true for Hart. Next year is going to be a good one for Hart. In addition to hosting the Oscars, the actor will be appearing in Jumanji 3 and lending his voice to The Secret Life of Pets 2. With these movies likely to be successful, hopefully his stint at the Academy Awards will do just as well. The 91st Oscars will air on ABC on Sunday, Feb. 24. This information comes to us from The Hollywood Reporter.